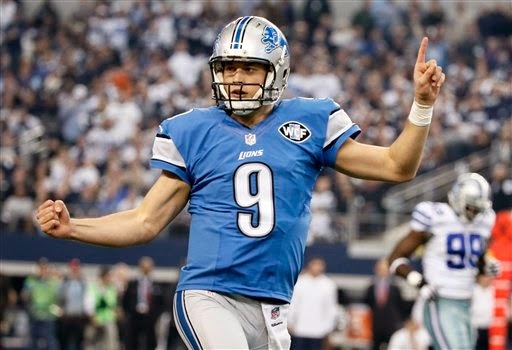 Matthew Stafford was wired for sound for Sunday's loss to the Dallas Cowboys. So imagine what the Lions quarterback had to say when the penalty flag was picked up in the Anthony Hitchens-Brandon Pettigrew pass interference fiasco. Wait, you don’t have to imagine. CBSsports.com reported on Stafford’s reaction today, prior to tonight’s “The NFL on Showtime” which will air the sequence at 9 p.m.
“That's unbelievable ... and you know it. You know it is, though. ... How does that get overturned? ... Congratulations. It's unbelievable." Stafford sought after several officials and, shortly after, continued to voice his displeasure: "Can we explain that or no?" Stafford asks. "Just flat out overturning a pass interference call?" The NFL through Dean Blandino, the head of officiating, admitted on Monday at least one mistake in judgment on the call.